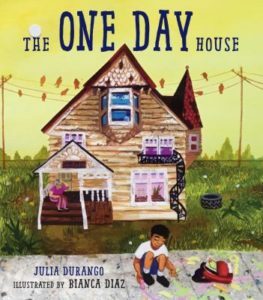 The One Day House by Julia Durango; illustrated by Bianca Diaz. Charlesbridge, Watertown, Massachusetts, 2017. Wilson has a plan for his neighbor Gigi’s tired-looking old house. He wants to paint it orange and yellow like the sun, to fix the windows so she can feel the breeze, and the chimney so she can make a fire. He shares his plans with Gigi, neighbors, and community members. One day, everyone comes together to bring Wilson’s vision to life. The sweet, simple story is enhanced by Bianca Diaz’s colorful collage illustrations. Perfect for sharing with younger elementary aged children, this book will hopefully spark conversations about giving back to the community, reaching out to neighbors, and enhancing the lives of others. Use language that is inappropriate for young children. This entry was posted in ReadPlayCreate and tagged book recommendation, community, picture books. Bookmark the permalink.